Prestige has been innovating kitchen and home needs products for the Indian homemaker for a long time now. No one understands the needs of the Indian kitchen the way Prestige does. Prestige Smart Kitchen e-Gift Card is a perfect gifting option for your loved ones enabling them to choose for various categories like non-stick pans, griddles, toasters, OTGs, induction cookers, gas stoves, pressure cookers and more. Validity : 180 Days from the date of issue. 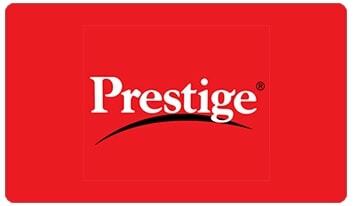 This E-Gift Card is redeemable for products and services at select Prestige Smart Kitchen stores. Please Login to upload your own file.